SHILLONG: Never before have people been as happy about a public service as they were on Friday when the first lot of JNNRUM buses finally hit the Shillong roads. Over 40 people who were stranded in Khyndailad junction were delighted to board a JNNURM bus. Within seconds the bus was packed and ready to leave the Khyndailad junction. Chief Minister Dr Mukul Sangma, Transport Minister AT Mondal and Mawprem legislator Manas Chaudhuri were the first VIP commuters to take a ride in the bus from Khyndailad junction till the Secretariat by paying the bus fares respectively. Accompanying them were Principal Secretary, Urban Affairs P Naik and District Transport Officer, East Khasi Hills, P Rynjah. Speaking to The Shillong Times, a visibly elated Transport Minister said, “Never before have I received so many SMSes thanking me for the bus services. Not even when I won the election did so many people congratulate me!” Mondal observed, adding that he was ready to launch the services on July 15 as promised but had to wait for the Chief Minister’s return. For the harassed commuters of Shillong the buses are an answer to their prayers. A passenger who boarded the bus for the first time said at last she was able to breathe inside a vehicle and also freely move her arms and legs. language, since the bus service is faster, better and cheaper. 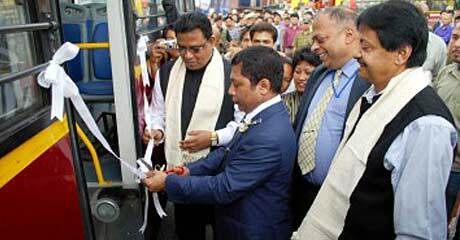 Earlier, at the inaugural function held at Khyndailad, the Chief Minister said these buses would ply in the Shillong city roads so that the commuters get some relief while travelling. “These buses are dedicated to the people of the State as they have been demanding it for a long time,” Dr Sangma added while addressing the inaugural ceremony of the JNNURM buses at Khyndailad on Friday afternoon. “So far, the State Government has pressed only 20 buses into service while the remaining 20 buses will be launched by Monday,” Mondal added. The buses will initially ply along the Greater Shillong routes covering areas like NEHU, Mawryngkneng and Upper Shillong. On its inauguration day, the buses covered most parts of the city and people were quite happy to welcome the much awaited buses which are the need of the hour in the city. The Central Government had sanctioned 120 buses for the State under the JNNURM and the next batch of the remaining buses would be released once the 40 buses start plying. Twenty of the 120 buses, which are of bigger size, would cater to the rural and far-flung areas of the State. So far, 45 drivers and equal number of conductors have been appointed and trained to operate the existing 40 buses. The buses have impressed one and all as the bus charges a mere Rs 7 from Bara Bazar to Madanryting and Rs 5 till Jylli’s Shop, Nongthymmai. Moreover, the conductors are also provided with a ticketing machine where commuters have to procure tickets for their respective destinations.